Hassocks v Horsham YMCA. Picture by PW Sporting Photography. Horsham YMCA suffered a rare defeat to in-form Hassocks as Peter Buckland’s side missed another opportunity to jump up the Premier Division table. A victory could have taken YM as high as seventh in the table, but instead a Liam Benson goal gave the Robins their fourth win in five. It was also just Hassocks’ tenth league victory over YM in a staggering 36 attempts. Benson’s sixth goal of the season 10 minutes from time was enough to decide the tie in the Robins’ favour and ease their relegation worries. YM boss Buckland boss couldn’t believe that his side didn’t take anything away from that game, saying that his side performed well in every aspect apart from their finishing. He commented: “If I live to be 100, I’ll never know how we didn’t win that game. I looked for a response after the Arundel game and I got it. I can’t fault any of them except for their finishing in front of goal. Phil Johnson scored twice for YM when the sides met at Gorings Mead back in October to single-handedly win the game for his current club, but he was kept quiet largely due to the excellent work of Ashley Marsh. The first half was something of a non-event as both sides cancelled each other out. Hassocks had the slightly better chances largely created by the marauding runs of Jack Rowe-Hurst who twice fired over good opportunities. The second of those was a particularly good one, especially with James Westlake arriving in support and there were questions asked about whether the enigmatic Rowe-Hurst should have slid him in rather than attempt to go himself. Half-time came at the wrong time for Hassocks given there were on top by that point and YM responded after the break by dominating proceedings, James Broadbent being forced into two fine saves to ensure things remained scoreless. It remained tight with the general consensus being that one goal would be enough to win it. And it was Hassocks who got it. The Robins won a corner which Rowe-Hurst controversially decided to take and his ball in was met by a bullet Jordan Badger header. That cannoned back off the bar and Benson showed superb reactions to head the loose ball home. 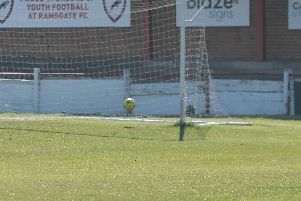 Michael Death almost made the points safe after a flowing move through Phil Gault, Westlake and Benson, eventually arriving with Death who fired just over with just the goalkeeper to beat. Up next for YM is a home encounter against Littlehampton this weekend. Buckland believes that if his side continue to play the way they do they’ll secure the win.